If you commission an artist for a likeness, you may not consider dressing-up as someone else for the sitting, but in the 1700s this was very fashionable. Men would typically took on iconic figures from history, showing physical and moral strength through someone else’s characteristics. And women often posed as virtuous allegorical themes such as love or poetry. Miss Anna Pitt, age 16 here, is depicted as Hebe, daughter of Zeus and Hera, goddess of eternal youth, cup-bearer to the gods and guardian of the fountain of youth. Dressed resplendently in Greek costume, her long locks flow behind her, as though she were sat in front of a wind machine. The soft colours and warm light portray this mortal goddess in a personable way, allowing us to see some of the sitter’s character. In one hand she holds ewer, a symbol of her great responsibility, and in her lap she holds a bowl from which a tame eagle eats, a symbol of her father Zeus. This was apparently painted from a live bird, a remarkable and probably quite terrifying feat. The model of painting portraits that fuse ancient allegory and modern fashion was made popular by such prolific painters of the age as Joshua Reynolds and George Romney. But I think it is fair to say that a woman artist painting a female sitter at this time in history gives Vigée-Lebrun an edge. The majority of her subjects were women, and looking broadly at her works you see her natural ability to depict her sitter’s femininity with understanding and energy, without losing any sense of mystery or decorum. From this work to her famous portraits of Marie Antoinette, she does what all great portrait painters do – provides us with an insight into another’s life and personality. 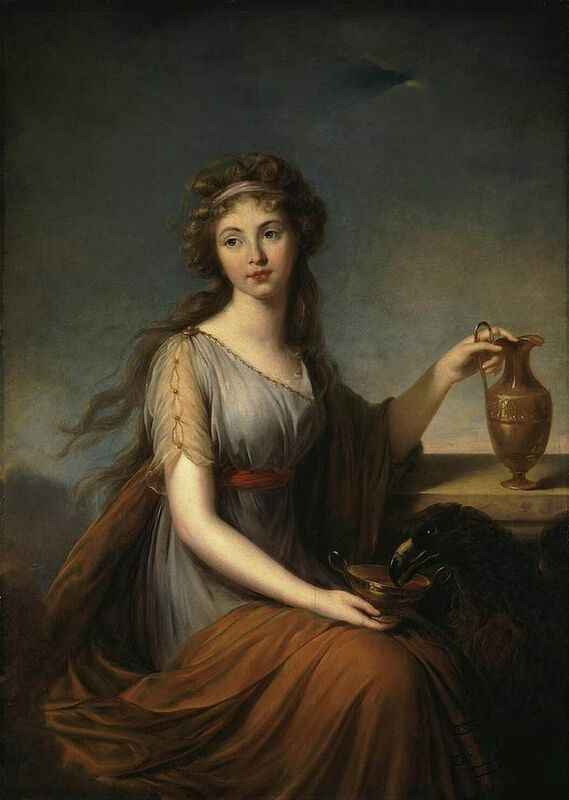 Élisabeth-Louise Vigée-Lebrun was considered the most famous female painter of the 18th century, earning a rare admission to the French Académie Royale, counting aristocrats and nobles among her clientele. Being a female meant that she was unable to take classes as a girl, but she was trained by her father and copied from the Old Masters in Paris galleries, persistent in her career choice. During her lifetime she was fortunate enough to travel Italy and Northern Europe, and survived the French Revolution. She painted some 660 portraits, most of which were women.